Police on Tuesday gunned down seven suspected gang members at Rukanga along Sagana-Makutano road in Kirinyaga County. The suspects, who were members of the dreaded Kayole ‘Gaza’ gang, were being trailed from Nairobi before police pounced on them at 1 pm. The Flying Squad officers set up a road block at Rukanga and when the suspects realized they had been cornered, they opened fire. 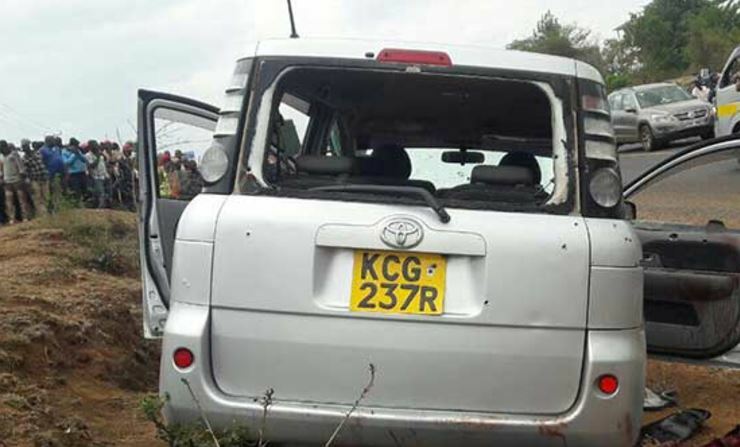 During the ensuing shootout, the DCI officers killed all the occupants who were in a saloon car. One of the suspects who tried to escape was killed few meters away from his accomplices. Samuel Saurey, OCPD Mwea West Sub-County, said the suspects were on a robbery mission. Police recovered two pistols, two home-made guns, 11 bullets, and 60 rolls of bhang. The incident comes two weeks after Gaza ring leader Michael Mwaniki alias Mwanii Sparta was shot dead in Ruiru. Seven ‘armed gangsters’ shot dead by police at Rukanga near Makutano on the Sagana-Makutano road. The suspected Gaza gang members were shot dead by DCI officers. They were pursued all the way from Kayole.